Jennifer Pharr Davis insists that you don’t need much more than a pair of sturdy walking shoes to get started on your first hiking adventure. And she knows her stuff. 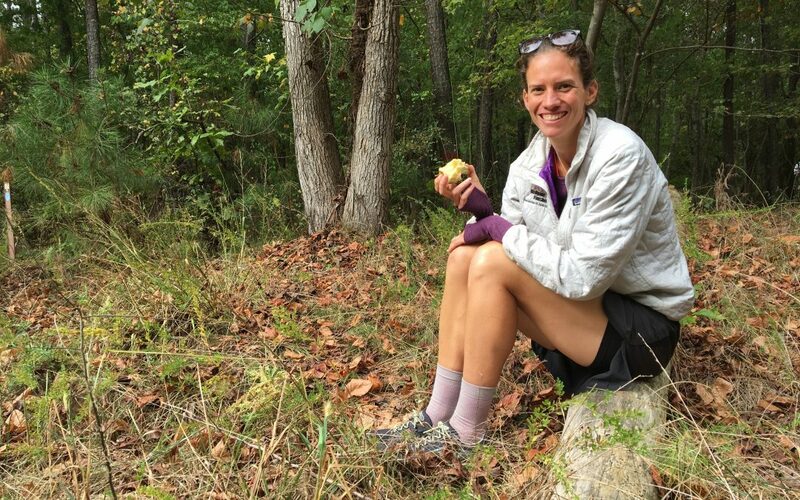 Jennifer held the speed record for hiking the Appalachian Trail (2,181 miles in 46 days, 11 hours, 20 minutes) for four years. She was a National Geographic Adventurer of the Year in 2012. She’s covered 14,000 miles of trails on six continents and has hiked in all 50 states. She owns a hiking company. She’s also a down-to-earth North Carolina native and mother of two. Jennifer is hiking the full length of North Carolina’s Mountains-to-Sea Trail – a 1,175-mile, three-month journey (with her husband and two kids in tow), to raise awareness for the trail and to encourage a love for the outdoors and a sense of unity in our state. The Mountains-to-Sea Trail – which runs from the Great Smoky Mountains to the Outer Banks – just celebrated its 40th birthday in September. Like any good middle-ager, the trail started from humble beginnings, is currently a work in progress, and has great ambitions – to add more miles showcasing the unique and diverse beauty of North Carolina. Let’s go all the way back to September 9, 1977. The National Trails Symposium held its annual conference at Lake Junaluska near Waynesville, North Carolina. A man named Howard Lee, who had been the first African American mayor of Chapel Hill (or any Southern city, for that matter) was newly appointed as Governor Jim Hunt’s Secretary of Natural Resources and Community Development. He gave a passionate speech at that conference that convinced North Carolina trail leaders to come on board and make this dream a reality. “He is a very charismatic speaker, and the idea lit a fire in the minds of people who loved trails across our state,” says Kate Dixon, executive director of Friends of the Mountains-to-Sea Trail. After an active political career, Howard is still on the board of Friends of the MST and, according to Kate, considers his part in the formation of the trail to be one of his life’s greatest accomplishments. Jumping forward to 2017 and Jennifer Pharr Davis’ journey, nearly 700 miles of trail have been completed in the past 40 years, with a series of back roads and bike trails knitting it all together. Starting at Clingmans Dome in the Great Smoky Mountains National Park, and ending at Jockey’s Ridge State Park on the coast at Nags Head, the trail passes through 37 counties, through state parks, and national forests. “I love North Carolina, I love this trail, and I love having adventures,” says Jennifer. “What’s great about the Mountains-to-Sea Trail is that there is a trail for any age, fitness level or ability. There is a trail for every phase of your life,” says Jennifer. She recently blogged about how different hiking a long trail is today than when she was setting speed records. The other thing about the MST is that you don’t have to commit months of your life to hike it. You can complete one of the 18 trail segments, or you can just hike a few miles on a Saturday afternoon. Or you could even do as Jennifer’s family does (when not hiking across the state), which is go less than a mile into the trail, letting her preschooler take the lead, and play in nature for a bit before turning back. “Raising kids is hard, and expensive,” says Jennifer. “Hiking is the perfect family activity for us. The kids love it, it’s free, and it wears them out.” A perfect combination for parents. Jennifer’s family lives in the North Carolina mountains, but beautiful trails (like the MST) are accessible all over the state. Start close-by. Don’t get super ambitious and plan to hike Yellowstone National Park in Wyoming your first time out. Need help finding a hike? Jennifer suggests looking for resources online or getting advice from your local outdoors store. Power in numbers. Don’t want to go by yourself? Try a Meetup group that suits your interests (search “hiking with a toddler” or “hiking group for women,” for instance). 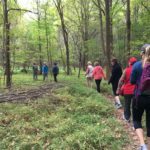 If you’re in North Carolina, check out Blue Cross NC’s Hike NC and its guided hikes at locations across the state. Don’t bite off more than you can chew. Start small. It’s okay if you just wander into the woods for 15 minutes and turn back around. Just being outside has proven mental health benefits. (Bonus points for being outside near water.) Being outside is especially great for kids. Be flexible. Be prepared to turn around, if needed. The weather might change. Your kid might have a meltdown. The trail may be longer or more difficult than anticipated. That’s okay. Flexibility is key, otherwise, you might be disappointed and won’t try again. Don’t spend a lot of money. You probably have what you need at home. Jennifer herself doesn’t have fancy equipment – she has a good pair of shoes, a bottle of water, a mobile phone, walking sticks (you won’t need these unless you go long distances), and a daypack to hold snacks, etc. “It’s never too late, or too early, to start hiking,” Jennifer says. Active in sports throughout her childhood and teen years, she didn’t get outside much until after college, when she decided to hike the Appalachian Trail. Little did she know that years later she’d break speed records hiking that same trail. Jennifer plans to complete the Mountains-to-Sea Trail on Nov. 18, at Jockey’s Ridge in the Outer Banks. Along the way, she’s leading hikes with different civic organizations (Girl Scouts, Neighborhood Ecology Corps, YMCA, among others) and has had several speaking engagements, to introduce more North Carolinians to the benefits of hiking in our state. Maybe you weren’t born yet in 1977 when the Mountains-to-Sea Trail was just a really good idea about to come to life. Or maybe 40 years ago you were wearing your plaid flared pants, watching the first Star Wars movie in the theater. In any case, think of all that has changed over the past 40 years. One thing that hasn’t changed – the beauty of the state of North Carolina. Take a Saturday and help the MST celebrate its birthday. Find a piece of the trail that’s right for you. Post your pictures to social media using #mountainstoseatrail. Spread the word about this beautiful path that offers breathtaking mountain views and passes by lighthouses. Let’s keep it going for another 40 years and beyond. Blue Cross NC is a sponsor of the Mountains-to-Sea Trail’s 40th-anniversary fund, as well as the eight organized hikes led by Jennifer Pharr Davis.